Every book of the Bible has a theme and a purpose, and that is true of the Book of James as well. Themes are topics that are addressed repeatedly. The main theme of James is that of faith and actions, but there are also other themes and key topics addressed in this book. In an effort to drive home his main point (act on your faith), James gives us several practical examples. We can assume these were relevant issues to his audience because James mentions them more than once in his letter. When we see a topic repeatedly addressed in a book of the Bible, we consider it a theme. The overall theme of the book of James can be summed up in the command we recently read in James 1:22: “Do not merely listen to the word, and so deceive yourselves. Do what it says.” As other translations have put it, let's be doers of the Word, not hearers only. James continues this theme throughout his entire letter. He gives his audience many examples on how to put our faith into action, and it is here that we see secondary themes. In the passage we will review today, James will warn us about favoritism. It seems his audience tended to show favor to the rich compared to the poor. This is not the only time James brings up the issue of material wealth. In fact, he is already told us that the poor should take pride in their high position and the rich in their humiliation (1:10), and he has admonished us to care for the widows and orphans in their distress (1:27). You can easily detect themes when you notice certain words used repeatedly. These are keywords. An example is the word law, which James mentioned in our last passage (1:25) and again here. Can you guess what I will ask you to do with these themes and keywords? Yes, let's keep track of them on a list. Why am I giving you so many lists to keep as you are studying this one book of the Bible? We have already started a list of God's character traits and a list of James's commands for us. I promise, this will be our last list but don't see it as a drudgery. These lists will come in handy every time you come back to your Book-of-James study notes to review or remember what you have learned. Do you need encouragement and to remember the great character of our God? Well, guess what, you already have a list of God's character qualities - and that's just the ones found in the book of James. What an encouraging read when you need to be reminded of who you are serving. Now, imagine starting these list for every book of the Bible that you study. Before you know it, you are intentionally reminding yourself of who God is, have a growing list of His qualities to come to whenever you need, and you will notice yourself more consciously paying attention to God's character as it appears in Scripture. You will no longer glance over these passages. You are training yourself to detect what a verse says about who God is. This is priceless. How will a list of themes and keywords have a similar benefit to us? It will be easy to come back to this list to remember what the Book of James is about. A quick glance at your Bible's pages won't be as good as having this list of themes and references of where they are found. You can come back to it anytime after you have studied through the Book of James and gone on to other books of the Bible, and it is this list that will give you the best reminder of what you learned in the Book of James. James has just explained to his audience what it looks like to really live out your faith. He talked about being quick to listen, slow to speak, and slow to become angry (James 1:19). He mentioned that if we want to consider ourselves religious, we should watch out words, care for those in need, and keep ourselves from being polluted by the world. James goes on to warn his audience to not show favoritism to the rich. He gives an example of someone coming into their church wearing expensive clothing and being treated better, such as being given preferred seating, while a poor person may even be treated in a demeaning manner. James says, this is not how God treats people, and so therefore, it is not how we should treat people. Did you catch that? We just talked about our growing list of God's character qualities. Are you seeing these as goals? Is it your desire to mirror God's character in your actions? We find out that these rich people who are being shown extra care at this church are actually exploiting these very believers and dishonoring the name of God. Should they really be shown favoritism? No. In fact, do you remember what Jesus said was the greatest commandment? Jesus told us to love God and love our neighbor. Well, James is making it very clear that showing favoritism to the rich - and therefore not treating the poor as equally loved - is breaking that commandment. When you show favoritism, you are not loving your neighbor. James reminds them that this sin that is not acceptable. It makes us lawbreakers just like any other sin. If we claim to follow Jesus, let's follow His example and live out His values. We are Jesus-followers who are in need of His mercy. If you look at our outline of the Book of James, you will see that he goes back and forth from addressing a certain issue he sees in his audience and to tieing this back into the faith-and-works tension. James continually reminds us to put our faith into action, then he gives us an example such as not showing favoritism to the rich, then he goes back to reminding us to put our faith into action. James uses this to emphasize that faith without action is dead. Yes, dead! Our faith should become evident in our action. James uses the example of Abraham who put his faith into action when he was willing to sacrifice his only son. This, of course, is an Old Testament reference. As James' audience was made up of Jewish believers, they would have perfectly remembered this story. James quotes from Genesis 15:6, “ Abraham believed God, and it was credited to him as righteousness.” Abraham's true faith became evident in his action. James then also uses the example of Rahab the prostitute who, according to Scripture, was considered righteous for hiding the Israelite spies and keeping them safe from her people. James repeats again that faith without works is dead. What does it mean then for faith to be dead? Let's considered what it would mean for faith to be alive and active. This type of faith would bear fruit and would actively do what it's meant to do. On the other hand, faith that is dead won't produce anything and becomes useless. Did you know that it was once disputed if the Book of James should be included in Scripture because it emphasizes works to such a degree? After all, aren't we saved by faith alone, not by works (Ephesians 2:8-9)?! We are completely saved by faith. Works cannot save us. God is holy and His standard is holy, and so even one sin makes us fall short of His glory. Nothing we can do can make up for that sin because it is simply a part of the holiness to which we are already called. Beyond that, God shows us that there is nothing mankind can do to conquer sin on our own and live a life faithful in our own strength. The bottom line is this: We need Jesus. We need a Savior! We cannot save ourselves by our own works. So our only way to salvation is through faith in Jesus Christ. It is His sacrifice that washes us clean and brings us back into a relationship with God. It's nothing we do; it is everything that He does. However, our faith should show. Other New Testament authors talk about the fruits of the spirit and even Jesus talked about how we when we are connected to God through Him will bear much fruit. If we don't see that fruit, we have to wonder if there's actually a connection to God. Of course, while we are on this side of heaven, we will continue to feel the struggle that Paul describes (Romans 7:15-20). However, we should see fruit in our life. If we are walking in a close relationship with God, then the Holy Spirit will help us conquer sin, reach out to others, love our neighbor, and start to see the of the world through the eyes of God. At this point, I want to highly encourage you to pick up the corresponding study guide to this Book of James series, Awaken Faith. It will allow you to dive even deeper into these Old Testament references, the faith-works tension, and the issue of favoritism addressed in the Book of James. 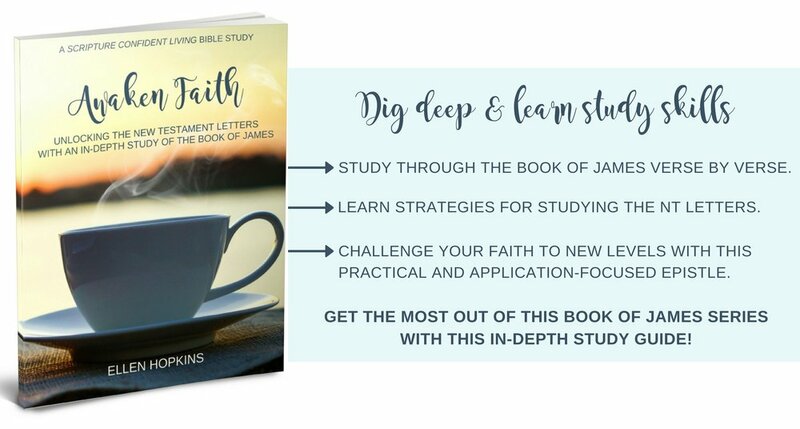 As James continues to challenge us to live out our faith boldly, I would really love to hear how the Holy Spirit has challenged you through our study of the book of James so far. We have gotten several practical examples now of what it looks like to act on our faith. What is one challenge you are taking with you today? Share with us in the comment section below. May God help us to continue to keep our hearts open to hearing His message as we continue to study through the book of James passage by passage and verse by verse. May we not only intellectually see themes in the Book of James but be challenged to take a look at our own lives to see how it lines up with Scripture. Remember, God is patient and kind. He is merciful and ready to help you put your faith into action.